"Everyone was very professional and easy to deal with. Obviously we don't know how well everything works yet as we've just had the..."
Everyone was very professional and easy to deal with. Obviously we don't know how well everything works yet as we've just had the work done. "The work was completed ahead of schedule in a neat and tidy manner. The system works very well and seems to have solved the..."
The work was completed ahead of schedule in a neat and tidy manner. The system works very well and seems to have solved the issues in my basement . "Jose was AMAZING and super helpful!" Jose was AMAZING and super helpful! "Absolutely Perfect. Everything was done perfectly. Very friendly and helpful and followup emails made me feel comfortable,..."
Absolutely Perfect. Everything was done perfectly. Very friendly and helpful and followup emails made me feel comfortable, knowing they were committed to the job. "We live in Port Elgin and after searching the internet, could not see our town covered by any of the "Basement System"..."
We live in Port Elgin and after searching the internet, could not see our town covered by any of the "Basement System" franchises. When we called the 1-800 number, they told us there was no representation here. Luckily I called Clarke Basement Systems! The call representative was familiar with our area and set up an appointment for an estimate. Just as they advertise, the office is very efficient with calling to confirm, e-mailing and following up. "Jose and his crew were amazing." Jose and his crew were amazing. We were devastated to find 3 inches of water in our newly renovated basement. After discovering the damage we spoke to three different service providers and were quoted very similar quotes. The decision was based on the satisfactory reviews and the excellent customer service provided by Steve Matthews during the process. He was patient and kind and took the time to explain the contract, the process and what we could expect at the completion of the project. When Jose finished the work, the basement space was cleaner than when he started. He and his team were excellent. I would recommend Clarke Basement Systems without hesitation. Just a short note to thank you for the responsive, informative and good work that we've experienced in working with Cory, Jose, and James over the past couple of weeks. Thanks to all! Looks great - I can stop worrying!!! Very polite & responsive.......a great bunch that worked well together. Jose started with Clarke Basement Systems as an Installation Specialist in 2005. Jose has taken the time and put in the effort to fully and comprehensively understand the science behind what we do and why we do it. He has held the title of Installation Foreman for a number of years and still finds every day to be more exciting than the last. Jose loves that at the end of the day he can go home knowing that he has helped someone to solve their issue and that the system he installs will keep their home dry forever! At first glance, the basement in the before picture looks similar to any other basement with tons of random things stored there, but once we were able to inspect the walls, we noticed a crack from one window to the other. It is easier to see in the after picture. Our customer in Toronto, Ontario, had an issue with the current condition of their basement window well. They were not happy as it was visually unappealing. They had a custom well that had a plastic cover over the top that was not fitting correctly. After meeting with Ron Monk, System Design Specialist, our customer had a chance to look over some options. They chose to install a SunWell Enclosure. This product is a polycarbonate enclosure that will not rust, rot, or corrode. The white colour and shape of the system will reflect the heat and allow more natural light to enter into the basement. A safety gate is fitted to the well and protects against falling into the well as well as keeping the well clean from any debris. This crawlspace in Toronto was dirty, musty and affected the rest of the house until Clarke Basement System's professional installation team transformed it into a clean and healthy space. A home in Toronto, Ontario had a tight space to work with when waterproofing. This is a standard issue to deal with when dealing with a home basement. We installed SuperSump® Premier Sump Pump System under the staircase as well as IceGuard® Discharge Line System on the exterior and a WaterGuard® Below-Floor Drain around the perimeter to keep water away from the basement. Lastly, we installed ThermalDry® Wall Insulation to prevent moisture and cold air from entering and retain heat. The customer can now confidently restore their basement to a healthy, dry and usable space! A leaky basement that was being affected by groundwater entering from various points has now transformed into a dry, healthy space thanks to several systems put into place by Clarke Basement Systems. The systems used were our patented WaterGuard® sub-floor perimeter drainage system, WaterGuard® port, ThermalDry® Wall System, SuperSump® Premier Sump System. These systems work together to capture water and drain it into the Sump system, while protecting the walls, reducing humidity and preventing heat loss. Thanks to Clarke Basement Systems, this Toronto, ON home, no longer has to worry about any unwanted basement water entry! A home in Toronto, Ontario had a basement that was very damp and leaked in several locations when it rained. The basement is large, and they would see water coming up through the ceramic tile joints. The issue was hydrostatic water pressure from below the house, as well as moisture penetration through the foundation walls. This unwanted water entry was a result of a failure of a proper external waterproofing system when building the home. The basement was finished, and they wanted to have space with no water leaking in causing mould and damage. The customer no longer wanted to deal with a smelly basement and damaged items, so they called Clarke Basement Systems. Jose Martinez and the team installed a WaterGuard® around the perimeter of the basement to capture groundwater. A ThermalDry® Wall membrane was used to direct moisture from foundation walls and direct it to the WaterGuard. A SuperSump® Premier sump pump with UltraSump® Battery Back-up in case of a power failure was installed to collect water and discharge it outside through our IceGuard® Discharge Line System. 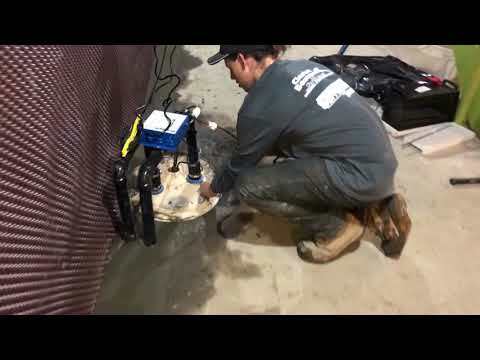 This system ensures that any ground water penetrating the basement is captured and pumped away from foundation. The customer is happy knowing they can finish the basement and use the space with no worry about water damage. A home in Bowmanville, Ontario, had water seeping into the basement walls when it rained and when the snow melted. The Basement was musty, and the floor was wet. The homeowner used the space to store items and did not want them to get damaged with the water and moisture. The customer called Clarke Basement Systems, and Chris Luke explained the job our team would do to fix the basement. Jose Martinez and the team came in and installed WaterGuard® Below-Floor Drain and CleanSpace® wall membrane. The WaterGuard® was Installed around the perimeter of the basement to collect seepage, and the wall membrane was installed to direct water into the drainage system. There was minimal space behind the water heater and furnace, but our team successfully installed the waterproofing system. This system keeps the floor dry, allowing the customer to store their items in a dry basement. A home in Oshawa, Ontario had a wet basement that was causing odours in the upstairs space of the house. The homeowner could not store any personal items in the basement because all of them would get damaged. They wanted to get rid of the mouldy, smelly, wet area to allow for storage and resale in the future. The customer called Clarke Basement Systems and spoke to Steve Matthews, who explained the solution that would be done to fix the home. Jose Martinez and the team came in and installed CleanSpace® Vapour Barrier, WaterGuard® Below-Floor Drain, and a TripleSafe™ sump pump. The CleanSpace® directs any water and moisture into the installed WaterGuard®, that then directs any excess water into the TripleSafe™ sump pump and is then directed away from the home. The customer was satisfied with the solution because the space is now dry and healthy. There is no longer any smell, and they feel confident storing items in the newly waterproofed area. A home in Thornhill, Ontario, had a basement apartment that was constantly leaking. Other companies had tried to fix the problem, but they couldn’t solve the problem. The basement was large, and there were many areas where water was seeping. The basement was a living space that generates revenue for the homeowner, and the space was un-liveable. The tenant moved out due to the problem. The customer contacted Clarke Basement Systems to find a solution. Jose Martinez and the team came in and installed a full perimeter of WaterGuard® Below-Floor drainage system, ThermalDry® wall membrane, a TripleSafe™ Complete sump pump System and Window Well Ducts to take care of the problem. The Sump Pump was put into a small area in the basement to make sure it was out of the way. With the collaboration of all these waterproofing products, the basement is permanently dry. The job was done correctly, efficiently and the customer can now re-finish the basement. A home in Markham, Ontario, had water seeping up from the floor and wall and the block foundation wall was full of water. This unwanted water was a problem because the prospective home buyers were not interested in buying a home with a leaking basement. The homeowner needed to sell the home to move away for a job. She called Clarke Basement Systems and spoke to Ben Wallis, who told her everything that would be done to fix the basement. Jose Martinez and the team installed WaterGuard® Below-Floor Drain around the perimeter of the basement, ThermalDry® wall membrane on the walls and a SuperSump® Premier Sump Pump System. Block wall voids were purged, so the wall did not retain water anymore. The ThermalDry® wall membrane directs any moisture into the WaterGuard®, and it then into the SuperSump®. The customer was satisfied because she was now able to obtain a home inspection report indicating the problem found a solution with a fully-transferable warranty. A customer living in a 1970's block foundation home noticed unwanted water and mould in his finished basement. Clarke Basement Systems removed the last few feet of drywall and installed the WaterGuard® Below-Floor Drain along the bottom of one wall and put up ThermalDry® Wall Vapour Barrier to provide a controlled drainage route for any water. This Markham, ON basement, is now transformed! Before there was an issue with water leaking in through floor-wall joints around the basement. Clarke Basement Systems installed our WaterGuard® Below-Floor Drainage System to drain and control the water seepage. This system collects and directs water into the sump system. Our customer had a concern with water seeping in through floor-wall joints around their basement. To protect the foundation from water seepage Clarke Basement Systems installed our ThermalDry® Wall Membrane that covers the entire basement foundation. Before, this homeowner had a problem with water leaking in through floor-wall joints in their basement. After adding an interior drainage system along the foundation walls and under the floor, our customers needed a new and reliable sump system. Our SuperSump® Premier Sump Pump System was the perfect solution to ease our customer's peace of mind. A home in Stouffville, Ontario, had a history of leaking water in different areas of the basement. Our company had previously installed sump pump equipment and a smaller piece of our WaterGuard® system years ago, but the problem moved to a different part of the basement. The customer just wanted more installation of the WaterGuard® because they knew it stopped the water issues the last time. The water was causing damage to this finished basement. Water was saturating the carpet, and the baseboard and the house smelled very musty. The customer is in the medical field and understood the urgency of keeping the basement dry. The customer called Clarke Basement Systems and talked to Ben Wallis who was the inspector and salesperson; he explained everything we would do from start to finish. Jose Martinez and the team came in and removed the wall materials, then opened up the concrete floor to install the waterproofing system. The WaterGuard® Below-Floor Drain was established to prevent water from being able to reach the basement floor elevation. ThermalDry® Wall Insulation was introduced to avoid any future condensation, wall sweating or leakage behind the membrane. Also, we installed WaterGuard® around another significant area of the basement which was leaking. However, there is still more to come in the future. The customer only wanted the specific parts with water leakage and told us they would contact us again if the issues moved again, knowing we can add onto it over time. The customer was satisfied because they have solved the next phase in their leaky basement. A home in King City, Ontario, had a cold cellar beneath the front porch and water was seeping in. There were stored items in the area, and they were getting wet and mouldy. The foundation was cracked and folded inward, creating urgency to fix the problem. The homeowner was dealing with persistent musty odours and was looking for a solution. The customer called Clarke Basement Systems, and Ben Wallis explained the process of our solution. Jose Martinez and the team installed WaterGuard® Below-Floor Drain, ThermalDry® wall membrane and Geo-Lock™ Wall Anchors to fix the problems. The Customer was satisfied because they didn't just spend money on their house – instead, they invested in the value of their house fixing some significant problems permanently with a fully-transferable warranty that goes with the home if they decide to sell. This finished basement in Aurora, Ontario had become damaged by water leaking in through the foundation walls. The WaterGuard® Below-Floor Drainage System is ideal for this situation. It is installed underneath the foundation of the floor and collects groundwater trying to enter the space. The water then drains into the sump system. The customer had an old home with a stone rubble foundation that leaked in the spring thaw. A full perimeter WaterGuard® Below-Floor Drain was installed and a TripleSafe™ Complete Sump Pump System. From dirty and musty to healthy and clean, we turned this East Gwillimbury, ON homeowner's crawlspace into something out of a dream! The WaterGuard® Drainage System is set beneath the floor to release the hydrostatic pressure. This system channels any water collecting into the existing sump pump. Our customer was delighted that they could now finish their basement with a piece of mind. The ThermalDry® Wall Membrane in placed over the perimeter of the exterior walls. This system captures any condensation and water and stops it from entering the space. The foil lining reflects heat back into the room eliminating the level of humidly and lowering heating costs. Our customers were thrilled to have a permeant solution for their water seepage issue. Here is our patented ThermalDry® Wall Membrane and finished WaterGuard® Below-Floor Drain system. These systems work together to provide an effective waterproofing solution for this Peterborough, ON home.